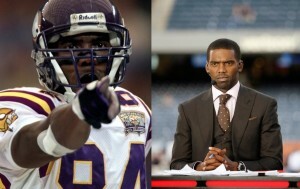 Randy Moss has come a long way from his “I play when I want to play” playing days. These days he mentors when he wants to mentor. *Randy Moss has come a long way from his “I play when I want to play” playing days. These days he seemingly mentors when he wants to mentor — and he has a good message to provide. *I’m not sure former Gophers baseball star Terrin Vavra, drafted in the third round by the Rockies, could have done much more for Class A Boise on Wednesday. He knocked in all six runs in a 6-5 victory — including a walk-off grand slam in the ninth. Vavra is hitting .417 overall. *Zach Lowe of ESPN.com has an informative and quite long piece on winners and losers in free agency this offseason. It has far more depth than the average piece of that type, explaining in detail consequences of salary cap decisions and other matters that have played out over the years. LaVine should develop into a useful player. He’s a better shooter than critics acknowledge; he hit 39 percent from deep over two seasons before tearing his ACL, suggesting he could crack 40 if he develops the faintest idea of what constitutes a good shot. … But his defense has been so, so bad, and his judgment on offense so spotty, that there is a higher-than-usual chance for a big-name restricted free agent — maybe 30 percent — that LaVine just isn’t good. There is a correspondingly small chance that he becomes an All-Star, and a whole lot of gray area in between. Paying almost $20 million per season to find out the end of that story is a shaky bet.